Wow this past weekend was a busy one! I did a lot of fun things so I thought I would share them. On Friday night I met Benzo after work and we went to dinner at Ingredient. Neither of us had ever been there before so we were excited to try a new place. 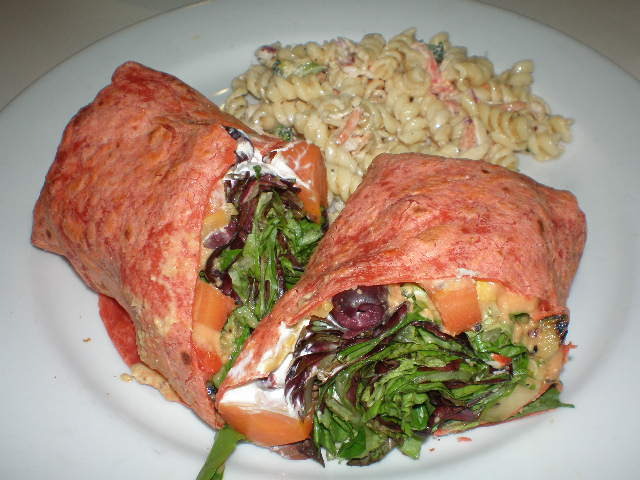 The wrap was light on the grilled veggies and heavy on the lettuce. And there was some kind of creamy dressing that I wasn’t expecting. Looking back at the menu it must be the tatziki sauce (?). I’ll have to ask more about that next time. We both really liked our meals and the restaurant in general. It had a nice atmosphere and was busy but not too crowded. We sat at a table by the window and right outside was a little ice skating rink! We watched the skaters while we ate. We both drank water so our meal was less than $20. After dinner we went to a home show which was going on last weekend. We were hoping to talk to some fence companies and shed companies. We need to get our fence replaced this year and we want to build a new shed. We set up two appointments to get quotes on fences but unfortunately there weren’t any shed people there. Darn! 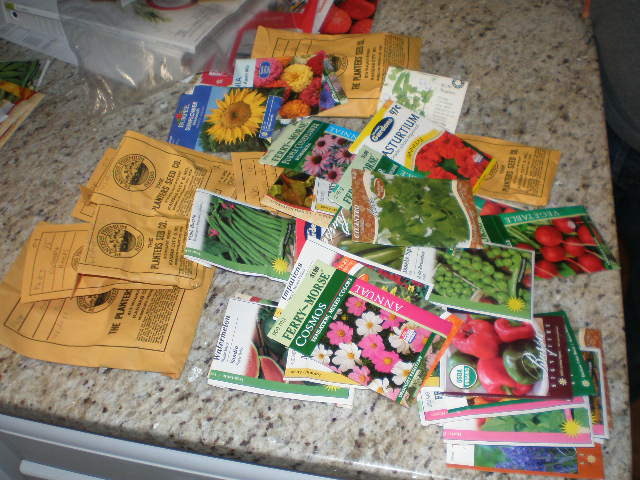 When we got home Friday night we dug out all the seeds we have from last year so we could see what we need to buy. 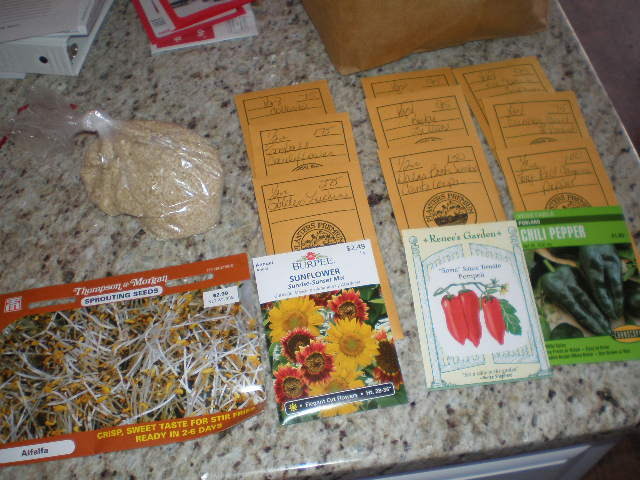 These are the seeds we had before we went seed shopping on Saturday. That’s a lot of seeds! It’s so easy to accumulate them! Saturday morning we hit the gym first thing. I did 5 miles on the treadmill. I’m training for a 10k at the end of March. My run sucked at the beginning because a) I wasn’t all that excited to run 5 whole miles on the treadmill and b) my iPod decided to DIE right when I started. So I ran 5 miles with just me and my thoughts. Once I got over being angry at my iPod it actually wasn’t all that bad and I ended up having a really good run. After the workout, we did a quick change in the locker room and headed downtown to the River Market area. First we went to the City Market to see what was going on. The big City Market is the only market in KC that is open all year round. 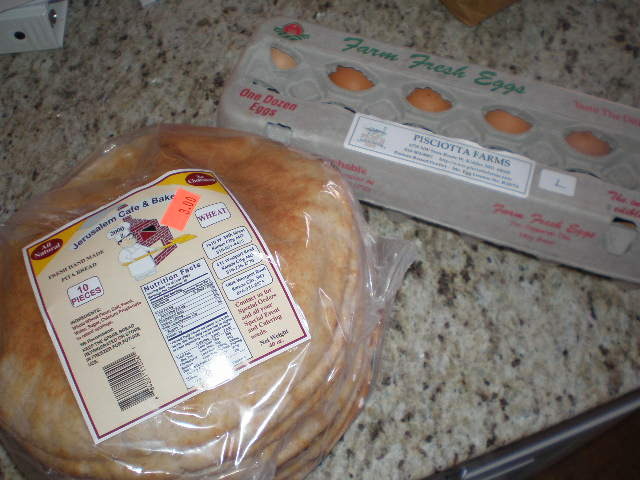 We picked up some fresh, pasture raised eggs from Pisciotta Farms and some fresh baked pita bread from Jerusalem Bakery. I asked the egg farmer if “pasture raised” means the chickens get to go outside. He assured me that yes his chickens were able to run around outside and hunt and forage like chickens are supposed to do. I picked up a brochure on their farm. It sounds like they have really good practices and we might start buying meat from them (for Benzo). I’m still trying to figure out how I feel about eating meat. I do feel better if the animals had a nice life while they were alive, but it still isn’t very nice to kill them for our food. Anyway that’s something I’m still trying to figure out. ** Side note – when shopping at the market it’s always good to talk to the farmers and ask them questions about their products. They are usually more than willing to answer any questions and are very proud of their practices. After the market, we met up with MIL and FIL for a delicious brunch at Cascone’s. I had a huge stack of pancakes and some scrambled eggs. Remember how I said I try to eat a healthy, plant-based diet most of the time? Well Saturday was not one of those days! 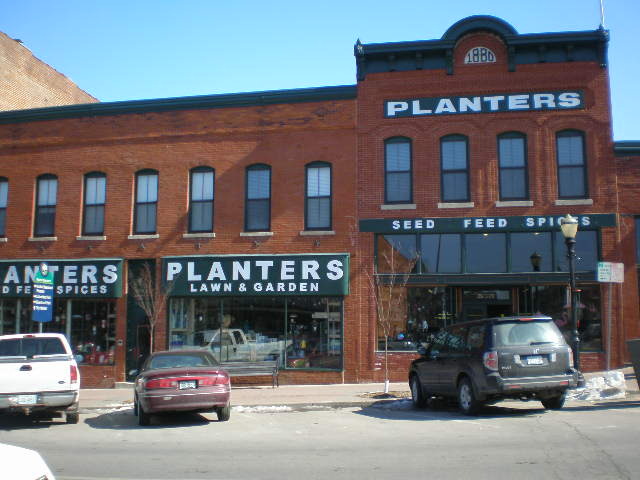 After brunch we all went to my favorite seed store – PLANTERS! Benzo and I had made a list of the seeds we needed to try to keep things under control. I still felt like a kid in a candy store. I really wanted to take a picture of the inside of the store but it was really busy that day and I didn’t want to look like a tool. We bought the following seeds: zucchini, golden zucchini, kale, collard greens, radishes, cauliflower, red leaf lettuce, roma tomatoes, sunflowers, cayenne pepper, chili peppers, cantaloupe and some alfalfa seeds so we can grow sprouts in the kitchen. We also bought 5 pounds of yukon gold seed potatoes. They didn’t have the bulk onion sets in yet, so we’ll have to go back. When I’m in the seed store surrounded by pictures of happy vegetables I want to grow EVERYTHING! Hence why I came home with so much. I can’t wait to plant them all! Saturday night we went to a hockey game. 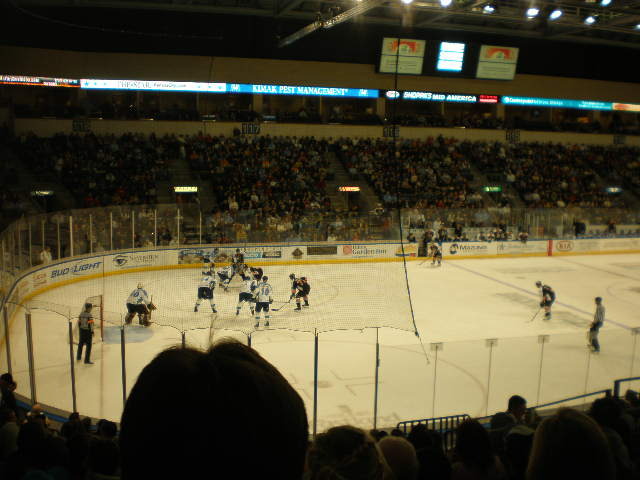 Kansas City has a minor league or semi-pro or whatever hockey team called The Mavericks. It was my first time going to a hockey game in probably 15 years. It was so much fun. And I ate even more junk food – a huge thing of chili cheese fries and a chocolate chip cookie as big as my head. 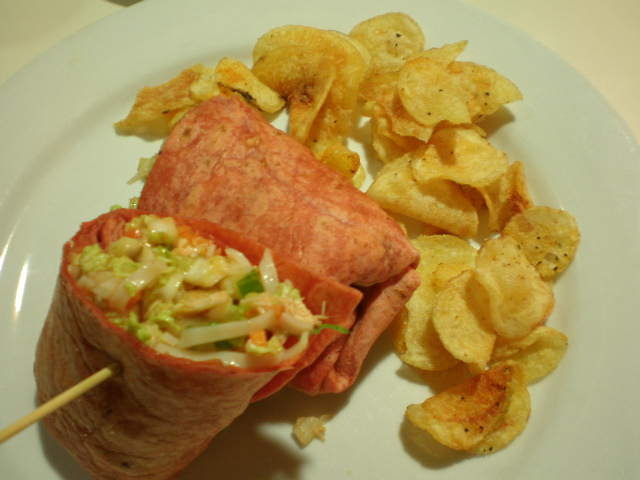 Saturday was not a day of quality eating but hey everyone needs those days from time to time. Our team won in overtime! Very exciting! Usually I’m not such a busy bee on the weekends. It was fun to do all those things but I feel like I didn’t get much rest and relaxation to prepare for this week. I’m definitely behind on household chores like laundry and cleaning. Hopefully I can get caught up this week. 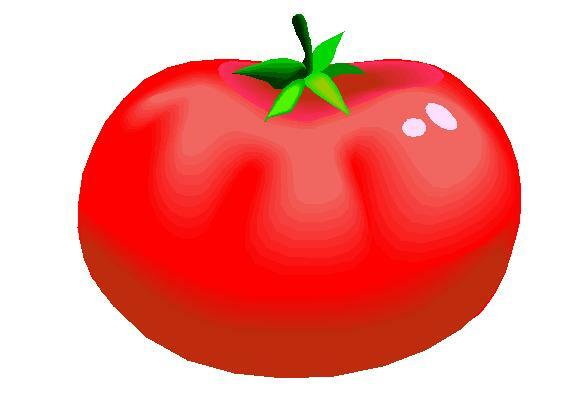 After buying all those seeds it seems like I’m growing everything imaginable in my garden this year. What are you planning on growing? Seed starting is this weekend for me (zone 5b)! 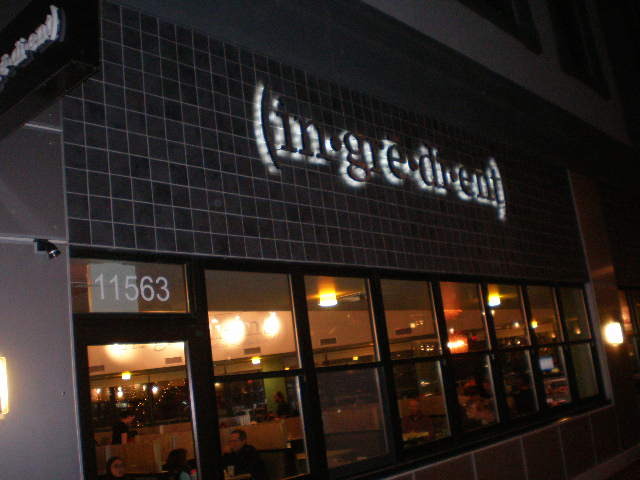 Previous Post March Challenge: Read the Ingredients!